Whether they are experts in electric submersible pumps, rod pumps, plunger lift systems, tubulars and sucker rods, or downhole separators and other equipment, the companies that provide artificial lift solutions share a goal: Helping operators not only produce high initial volumes, but also maintain production as economically as possible over a well’s full life. That often means extending a given pump’s minimum and maximum flow rates and enhancing its durability to reduce how frequently an operator needs to pull and replace equipment. Toward that end, pump providers and other artificial lift experts say they are employing slicker materials, optimizing component geometries and refining techniques for reducing flowing bottom-hole pressure. Simultaneously, they are coming up with ways to improve safety, including blowout preventers to protect wellheads against completion-induced pressure spikes and a portable device that makes it easier for well technicians to respace rod pumps. Most unconventional wells’ artificial lift programs start with ESPs or gas lift, says Jeff Dwiggins, managing director of Artificial Lift Solutions Pte. Ltd. “Companies that want to maximize initial production rates lean toward ESPs because they offer higher volumes, while those that are driven by operating costs lean toward gas lift, which can be more reliable if gas is available,” he assesses. ESPs are becoming more reliable as manufacturers come up with ways to minimize the damage from solids and thermal cycles, and operators get better at mitigating operational issues, Dwiggins says. He argues that the pumps’ ability to handle high production volumes from moderately deviated wells can make managing their inherent reliability issues worthwhile. Operators concerned with prolonging ESP life should invest in resources, Dwiggins advises. “An operator that understands how to manage ESPs and address problems before they become detrimental to the system will be less likely to have issues,” he says. When ESPs fail, determining the root cause can be tricky, Dwiggins reports. “There is almost always more than one problem, and the one that caused the unit to fail may not be the biggest concern from a reliability standpoint,” he says. It can be tempting to attribute failures to manufacturing errors, but Dwiggins says it is worth considering operational issues. He points out that an ESP’s reliability goes down significantly when it is used outside of the recommended operating window. As industry activity recovers, Dwiggins encourages operators to support strong quality assurance. “We would all love to buy a Chevy Malibu and get the same quality as a BMW, but the reality is that we get what we pay for,” he says. Horizontal wells’ artificial lift programs often start with a large ESP, then move to a small ESP and finally to a rod pump, notes Ryan Gernentz, director of mechanical engineering and quality at Endurance Lift Solutions. To mitigate the need to employ a small ESP, he says many operators are adopting lightweight fiberglass sucker rods, which can produce larger liquid volumes than steel rods because they stretch on the down stroke and enable longer plunger travel. Gernentz predicts the high-flow end fittings, which were undergoing initial field trials in early June, will boost production considerably. “With pumps, small changes in pressure drop lead to large increases in production. This change has the potential to reduce the pressure drop from each connection by more than 60 percent. With more than 100 connections in a rod string, we think that will add up to a meaningful difference in production,” he says. The compact design utilizes a 7/8 full size coupling and pin arrangement that will place the one-time pull rating at 65,000 pounds, Gernentz mentions. He says that with most fiberglass venders already using this pull number, there should be no issue with being able to unseat pumps. The rods’ working load and other characteristics will remain the same as Endurance’s current product lines. To extend the life of metal equipment such as rod pumps, plungers and ESPs, Endurance President Dan Runzheimer says the company has partnered with B4C Technologies to find upstream applications for a surface treatment that increases metal’s resistance to mechanical wear, abrasion and corrosion. Describing the treatment as a revolutionary method of thermal boron diffusion originally developed for military applications, he says it has increased certain equipment’s run life by an average of 400 percent. Metal treated with a thermal boron diffusion process developed for military applications (middle) has exceptional resistance to mechanical wear, abrasion and corrosion. Endurance Lift Solutions says the treatment significantly extends equipment run times and has a wide range of applications in artificial lift and other upstream verticals. According to Runzheimer, the technology uses a proprietary chemical formula to produce a slick, hard intermetallic ceramic boride case layer at the metal surface. The process works by migrating boron atoms into the surface, where they attach to the dominant substrate element such as iron. This subsequently converts the surface to a protective layer composed of an intermetallic ceramic that is rich in boron, which Runzheimer points out is an excellent lubricant. “The treatment gives the metal a lower coefficient of friction, so it will generate less heat when it slides across other surfaces, thus lasting longer. Once treated, the metal surfaces also become highly resistant to corrosive fluids,” he says. Through partnerships with operators and service companies, Materion Performance Alloys reports it is expanding the artificial lift applications for a durable, non-galling copper-nickel-tin alloy it originally tested with Hess Corp. to extend the life of sucker rod couplings. Its latest development is a valve rod guide bushing (VRGB) coupling intended for the bushing that connects the rod string to the pump drive rod, says Diane Nielsen, Materion’s global oil and gas manager. “In deep wells that use hollow rods, buckling at the bottom of the string causes frequent contact between the bushing and the production tubing,” she says. “This contact wears out the tubing. To protect production tubing from buckling-induced wear in deep wells with hollow rods, Materion Performance Alloys has introduced a coupling for the bushing that connects the rod string to the pump drive rod. The company says the coupling uses a wide design to reduce buckling and, therefore, contact with the production tubing. It is made from a low-friction alloy that minimizes damage when contact occurs. ESPs and rod pumps benefit from consistent fluid delivery, observes Brian Ellithorp, president of Echometer UPS (Ultimate Production System). He says achieving such consistency can be difficult in horizontal wells. Even relatively straight laterals have low points that collect liquid and high points that collect gas, he points out, creating a situation where the gas-to-liquids ratio at the pump tends to swing back and forth. To minimize those swings’ negative effects, operators try to separate gas and liquids ahead of the pump. Unfortunately, that effort does nothing to address the root problem of slugging, which Ellithorp notes can outpace a separator’s ability or make it difficult to keep the pump full. Putting the pump in or through the curve can help in some instances, but that frequently shortens its life so much that it causes a significant increase in maintenance costs, he relates. As an alternative, Ellithorp recommends combining a separator with an isolated tailpipe that extends into the curve and has a small inner diameter, much smaller than the production casing. The smaller diameter increases the production stream’s flowing velocity and causes the gas and liquid mix to supersede required critical velocity, which makes flow more uniform while gasifying the liquid so it is easier to lift. Ellithorp says this increases production and reduces the flowing bottom-hole pressure, allowing the pump to stay above the curve longer. Echometer UPS is refining systems that help rod and electric submersible pumps in horizontal wells run efficiently by using isolation to force gas and liquids through a tailpipe that extends into the lateral. The company explains that the tailpipe’s small diameter helps the production stream reach critical velocity, making flow more uniform and gasifying the liquid so it is easier to lift. This increases pump fill rates and production significantly. Those correlations do not accurately account for the effect inclination has on how fluids and gases separate as they travel through the curve, Ellithorp details. “By using more accurate correlations, we have implemented a series of upgrades that should feed fluids and gases more efficiently through the curve,” he reports. The design improvements have paid off, states Ellithorp, noting that the tailpipe system can be used in a much wider variety of applications. As an example, he cites installations in Cleveland Wash wells that are around seven years old. “One of the wells had a 90-day average production of 10 barrels of oil and 37 Mcf of gas a day before the installation. In the 70 days after installation, oil production doubled to a sustained rate of 20 bbl/d and gas production steadily climbed to reach 150 Mcf/d,” he says. Because blowouts induced by completions put lives at risk and damage equipment, operators generally shut down and seal wells when frac jobs are being performed close by. This has created a need for high-pressure BOPs that are easy to activate and reliable even after multiple uses, says Denis Blaquiere, managing director of Oil Lift Technology Inc., an Apergy company. Toward that end, Blaquiere says Oil Lift has developed an elastomer geared for BOPs in unconventional plays. “We needed to make sure the elastomer could endure the oil and corrosion it encountered during each use without degrading so the operator could be confident it would work several times,” he says. He adds that Oil Lift is developing a hydraulic system that allows BOPs to be activated remotely, eliminating the need for someone to visit each pad ahead of a frac job. In response to the potential for hydraulic fracturing to cause pressure spikes in nearby wells, Oil Lift Technology Inc. has introduced blowout preventers designed to be activated ahead of completions. The company says the BOPs, which include 3,000, 5,000 and 10,000 psi units, are easy to activate and stay reliable even after multiple uses. 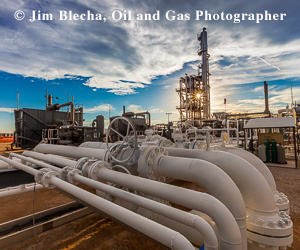 To offer the higher rating at that price, Blaquiere says Oil Lift standardized components across wellhead configurations and optimized its supply chain to source components at a low cost. “Because the system is integrated, it eliminates the connection between the flow T and the BOP, which reduces leak points. It also cuts a few inches off the wellhead stack’s height, which should make it easier to work around when spacing pumps or tapping bottom,” he comments. All of the company’s BOPs can lock the polished rod in place to increase safety during stuffing box changes and other well servicing tasks, Blaquiere mentions. “By locking the polished rod in place below the seal housing, a field hand can change the seals without risking a pressure breakthrough or movement that could cause harm,” he says. Locking the rod in place can make work faster and safer, Blaquiere adds. As an example, he estimates it cuts the time required to change stuffing boxes in half. “In addition, it eliminates the need to use a crane to hold the rod string up,” he says. To reduce the risk, time and cost associated with spacing rod pumps, a seasoned well technician developed a hydraulic lifting device that raises and lowers rod strings safely and precisely, according to Stephen Eubank, a business development manager at Rocky Mountain Oilfield Warehouse, the lift’s manufacturer. Remove lockout/tagout, disengage the brake and pawl, and restart the pumping unit. If the technician eyeballs where to put the clamp incorrectly, the entire process must be repeated, Eubank mentions. He says this is undesirable given the time and risks involved. Rocky Mountain Oilfield Warehouse manufactures and markets a portable system that lets well technicians optimize rod pump spacing without climbing on equipment or putting their hands between pinch points. The system’s hydraulic lifting device can raise and lower the rod string, which RMOW says eliminates the need to turn the pump on and off repeatedly during the process, a boon for safety and speed. Eubank adds that the process is slow and hard on the pumping unit. “Rolling the pumping unit over to create the gap needed to adjust the top clamp often causes the bottom clamp to slam into the stack-out tool, which strains the prime mover and the string. The system is designed for smooth strokes, not sudden slams and jolts,” he explains. Finally, the technician bleeds pressure from the lift to lower the rod string until the top clamp rests on the spacer, turns off and removes the lift, and restarts the pumping unit, Eubank outlines. The hydraulic lift has performed well in Williston Basin winters and Texas summer heat, Eubank reports. With the ability to lift 60,000 pounds, he says it should easily handle even the longest strings. “Most of the components are stored in a rugged case, and we designed all of them to be easy to maintain,” he adds.